Everyone carrying their iPads around the office have their own preferred method of protecting the mobile device. At the minimum, a vinyl sticker back and Apple cover. Then, there are the cases, offering edge protecting, drop and nudge protection, those that make the iPads look like a book and those that are positioned after nicer cases. Generally, if the case isn’t minimalist, it greatly increases the size of the iPad. 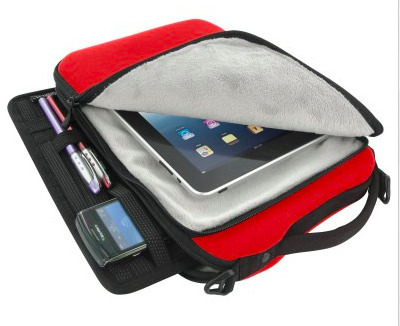 For those needing to carry more than just their iPad, they tend to toss it in their notebook computer case. When researching a method to hold smaller gadgets like phones, pens and power supplies in their computer bag, a coworker found card with bands on it. Then, when researching the card’s suppliers found that organize.com offered the card in a small case that included a pocket for an iPad. The case is neoprene, made by Cocoon. We have a couple on order to see if they work for team members that buzz around the office and then out to meetings offsite. Perhaps, cutting down on the need to carry a larger case when on the go. What would be really nice is if the zipper pocket lets the iPad be pulled out the front when the back is still over the shoulder.